In April, earlier this year, I and a group of other researchers at Pax Herbals had a meeting with sixty local farmers in Ewu, a village in Edo State. The meeting was part of Pax Herbal’s participatory action research strategy. Two-pronged, the strategy comprises getting local communities to identify, discuss and analyse their agricultural challenges and, secondly, assisting these communities to develop home-grown solutions. The farmers in Ewu complained that cassava farming is no longer profitable. According to them, while many families in the village cultivate cassava—which they harvest and eat—only a few of these families are able to sell their harvest, most of which they end up selling as leftovers. Ultimately, in Ewu, each family practises subsistence farming. The farmers spend a great deal of time and energy in the sun clearing bushes, planting and then waiting for the cassava to grow and mature. Eventually, each farm is able to produce a few bags of cassava, and each bag is priced very cheaply in the local market. 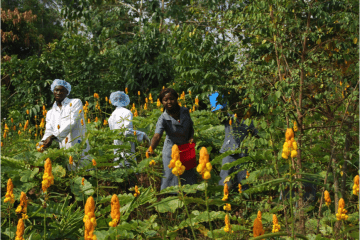 To generate a higher yield of cassava, the government distributes thousands of fertilisers. But the farmers insist the fertilisers don’t provide the solution, and only deplete the soil. They argue, instead, that organic farming is best. At the meeting in April, we engaged the most elderly women in the community. These grandmothers and great-grandmothers are custodians of knowledge; the oldest among them was an energetic woman, who is 120 years old. Others were between the ages of 75 to 110. A month later, at our next meeting with the local community, the group of farmers decided to explore oyster mushroom farming. At first, the farmers believed that mushrooms only grow in the wild, and none of them, it seemed, knew mushrooms could be cultivated locally. But the way forward, we soon discovered, is to blend local, indigenous knowledge with exogenous knowledge. The theory of communitalism, which I developed in my book, “Integral Community Enterprise in Africa” touches on this. Pax Herbals employs the theory of communitalism in dealing with local farmers. Communitalism is based on the need to forge synergies between different modes of knowledge creation. Communitalism acts, also, to bridge the gap between local and foreign insight. The fostering of inter and intra-communal connections built on knowledge creation is what I refer to in the book, as a communiversity, a calabash of wisdom into which knowledge flows to be shared by the community, and into which everybody has something to contribute. Within two months, I organized a training session on mushroom cultivation for a select group of the local farmers. The two species cultivated during the session were Pleurotus Ostreatus and Pleurotus Pulmonarius. Despite the fact that several of the farmers selected did not attend—because they did not believe that mushrooms could be locally cultivated—those who attended were enthralled, surprised and excited. It was a eureka moment for the participants. Since the initial training, hundreds of local farmers have applied to join our programme. Our goal is to provide small-scale farmers the capacity to move from subsistence farming to secure livelihoods; from food sufficiency to food security; from agriculture to agribusiness. Whereas a 100-foot plot of land can only produce a few cassavas worth N35,000, the same plot of land can produce bags of mushrooms worth N150,000. Unlike cassava cultivation, mushroom farming is conducted indoors, and the waste from the mushroom soil is far more useful as fertilisers than the synthetic fertilizers the government provides. Do not give the people what they do not ask for. Development or community workers often present communities with ready-made answers to issues we have identified as problems, and we convince the people to accept our solutions. Convincing people is always easy. But the real impact is measured by how long those solutions last. What I’ve observed is that unless the people ‘own’ the solutions, they will abandon it when you are gone. More money does not translate into better food. We often think that the reason why poor people do not eat well is because they are poor. The reality on the ground is different. Higher incomes do not automatically translate into better diets, as the cost of food is, often, not the only reason people have less healthy diets. The most important factor in eating a healthy, balanced diet is not money but knowledge—of the right food, the right food combination and the right times to eat. People in the local communities know more than they can tell. Local communities have vast deposits of implicit knowledge. This knowledge is a potential asset that can be explored and tapped for the good of the society. But tapping into the knowledge reserve of communities requires an approach to education in the original sense of educare, the Latin word from which the English word ‘education’ is derived. Educare means to draw out, to bring out what lies within. We tend to see education as stuffing students with facts, figures and ideas. In this sense, institutions of learning become places separated from the community; laboratories where objective knowledge is generated and fed to students. Such an approach to education creates a dichotomy between teaching and learning, where the teacher is the one who knows it all, while the student is an empty vessel. I developed the theory of communitalism to demonstrate the importance of integral research to solving Africa’s socioeconomic, political and spiritual problems. I define integral research as research that not only analyses problems, but proposes concrete solutions and then strives to act on the proposed solutions through practical actions. In integral research, the researcher is at the same time a community worker, activist, thinker, scientist, innovator and entrepreneur. is the Director of the Ofure (Pax) Integral Research and Development Initiative.